Optical Illusions neither fool your mind or trick you eyes. However optical illusions illustrates how our visual perceptions works and it shows the limitations of visual ability. Optical Illusions are fun to watch and many times these makes us say "WOW. how is this possible?" 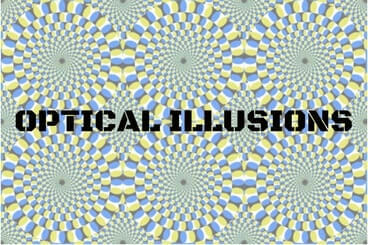 Optical Illusions will make you feel that your mind or eyes are tricked. Some of the Optical Illusions will blow your mind. In some of the Optical Illusions you will see different things if you watch it in different time frames. Some Optical Illusion are natural i.e. sometime photo clicked naturally turns into optical illusion. Sometimes Optical Illusions depends upon our perspective. The moment we change our perspective, we will see something different. Here on this website there are many Optical Illusions pages and below is the list of all these pages in the chronological order. Do click on the links below to go to corresponding page.